I'm happy to report that after the awful wire work/FX ridden wuxia swordplay period, Hong Kong cinema is once again enjoying bare-knuckle kung fu boom. Wilson Yip's biographical film on the Wing Chun School grandmaster Ip Man, trailing him through the Japanese occupation, the big battle and his flight to Hong Kong is a sumptuous experience. Master Ip is a humble aristocrat who doesn't want to show off his skills. He only receives guests who wants to 'practice' with him occasionally in his big mansion where he lives with his wife and young son. But the words get out that he beat every master in Fo Shan, a southern Chinese city famous for its numerous martial art schools. But the Japanese occupation begins and Ip goes through hardships just like any of his fellow Chinese. After seeing his friends beaten to death in a martial arts match set up by a Bushido practicing Japanese captain while working at a coal factory, Ip once again picks up the trade he had to abandon in order to feed his family in desperate times. Master Ip story has been loosely adapted to martial arts films many times(after Bruce Lee and Jet Li, now it's Tony Leung as Ip Man in Wong Kar-wai's latest, Grand Master). 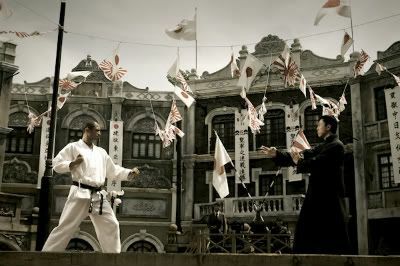 But nationalism and heavy handedness aside, Ip Man is every martial arts fan's dream. Donnie Yen brings righteousness and stoicism that fit the role well. Sammo Hung's fight choreography is stripped down to basics, but it's a glorious one. I can't wait to see Ip Man 2 in which Sammo Hung co-stars.